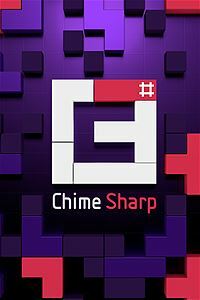 Chime Sharp, a sequel to the 2010 XBLA music / puzzle game Chime, brings the series’ familiar puzzle gameplay with an all new electronica soundtrack to Xbox One and PS4. In addition to the standard mode where you place pieces to try to completely fill in a board, Chime Sharp also has a couple of brand new gameplay modes that put different twists on the formula and give an already wonderfully addictive game a stunning amount of replay value. See all of the details in our full Chime Sharp Xbox One review. Chime is a puzzle game where your objective is to completely fill in the playing field by building “quads” – blocks of at least 3x3 squares – by placing pieces in the field. Once you have a quad, you can continue building onto it by adding more pieces to the side to make it bigger and bigger. The trick to Chime, however, is that you have a couple of different time limits to contend with. The first is an overall timer that extends slightly every time you make a quad on a new section of the field. The second is a line that sweeps across the field on a set rhythm according to the particular song that accompanies that field. This line clears away completed quads as well as unused pieces that you weren’t able to make quads with. In a neat touch, as the board gets more filled out, the musical track fills out and gets more complete as well. The idea is that you have to fill in the field as fast and efficiently as possible. Bigger quads obviously cover more space and give you a higher score, and as long as you’re fast enough and expand the quad before the next pass, you can keep adding onto them through multiple passes of the line. Being fast and efficient and getting lucky with the right pieces you need is tougher than it sounds, though, and completing even one board on Chime Sharp is extremely challenging at first. 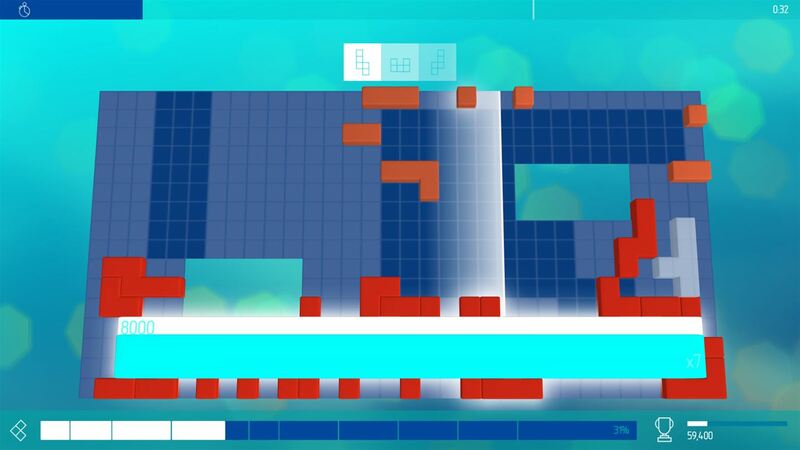 See our Quatros Origins and Anode reviews for more Xbox One puzzle games. Every board has a different shape, not every board uses the same set of shapes, and every song has a different rhythm, so every new board is a fresh new challenge to overcome. It is difficult, particularly on some songs / boards, but it is also extremely addictive and fun. It is also interesting in that you need to rush and do things quickly, but the game isn’t stressful. In fact, it is the opposite. 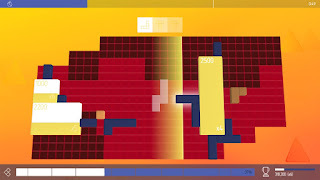 You feel a sort of trance-like calm while playing the game, which is awesome and compels you to keep playing. When you’ve mastered the standard mode you can come back for a couple of additional modes. Sharp mode gives you a life bar that depletes when you leave unused pieces on the board, but you can also get life back by making perfect quads. Strike mode gives you a 90-second hard time limit. And challenge mode is a ramped up and even more difficult variation of the standard mode. All in all, there’s a lot to do for puzzle fans in Chime Sharp. And even if you only play the standard mode – which, honestly, is still the best – you’re more than getting your $10 worth here. The presentation deserves special praise in Chime Sharp because it is all pretty spectacular. The visuals are simple since you’re just playing on flat grids, but the game is nice and sharp and clear and the use of colors in the backgrounds make it all pop and look good. The music, obviously, is an important factor here and the selection of electronic tracks from artists like CHVRCHES and Chipzel (see my Spectra review), among many others, are pretty darn awesome. 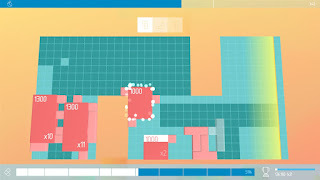 Chime Sharp is a great sequel to the original Chime and well worth a look for puzzle fans. The soundtrack is awesome (and I don’t even really care for electronic music that much) and the gameplay is addictive and fun and surprisingly calming despite the speed at which you actually need to play the game. Chime Sharp is a great all around package that I can highly recommend.